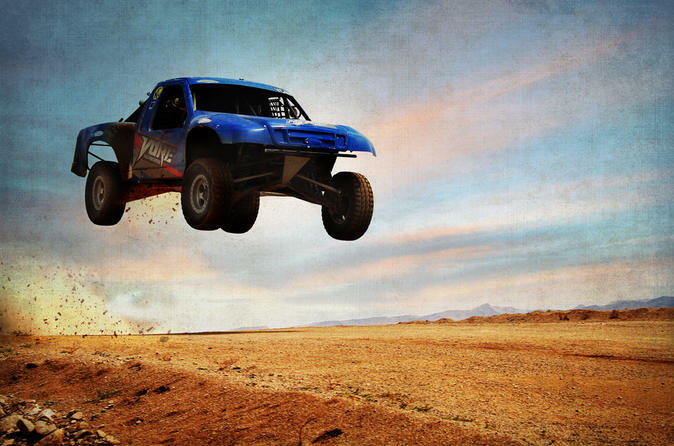 Enjoy this exciting race truck adventure in Sin City. Experience the thrill of off-road desert driving on a famous short-course racing track near the Las Vegas Strip. Drive on a professionally maintained, 'stadium-like' track. The highlight of the experience will be jumping a truck over 20 feet in the air. Use of a safety helmet plus a Las Vegas hotel pickup and drop-off are included. The race track for the day is a world-renowned, arena-style, stadium-like, professional-level, short-course race track that is one of the best built off-road tracks around. Ever attended a professional, Pro2 Lucas oil or TORQ short course off-road race and wanted to do that, too? Well, now it's possible Hundreds of development hours have been put to good use to ensure that driving on a pro-level, short-course track will produce one of the best driving experiences available in Las Vegas. This short-course track has five major jumps — one being a 40-foot table-top jump with 20 feet of air — featuring high-banked, high-speed, drifting turns and a very fun rhythm section. But don't let those gnarly banks frighten — safety comes first. Each person watches an instructional video, then has an orientation and demo lap. All the necessary gear, plus round-trip transportation from select Las Vegas hotels, is provided.